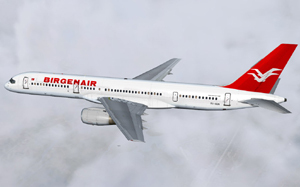 At 0342, Birgenair flight ALW-301, a charter flight for Airline Alas Nacionales, a Boeing Model 757-200, took off from Gregario Luperon International Airport, Puerto Plata, Dominican Republic, with a final destination of Frankfurt, Germany. During the takeoff roll the captain noticed his airspeed indicator was not properly displaying airspeed. He continued the takeoff using speed calls from the first officer, whose airspeed indicator seemed to be functioning properly. After becoming airborne the captain's airspeed indicator seemed to begin functioning, and indicating an increasing airspeed. During climb-out, after engaging the autopilot and autothrottle, the crew realized that airspeed indications were abnormal. The airplane had reached an unusually high attitude, yet speed indications were increasing, resulting in an overspeed warning. Believing the aural warning to be in error, the crew deactivated the overspeed warning system. Though the indicated airspeed remained high, the stall warning "stick shaker" activated, and the autothrottle and Vertical Navigation (VNAV) mode disengaged. Investigators determined that the crew was confused by the combination of airplane pitch, indicated airspeed, and conflicting warnings. Flight recorder data indicated a number of thrust and pitch excursions prior to the disconnection of the autopilot. Following a number of pitch and thrust changes, airplane control was lost, and approximately 5 minutes after takeoff, the aircraft impacted the water in a severe nose-down attitude, approximately 14 nm northeast of Puerto Plata. All 13 crew and 176 passengers were killed. The Board determined the probable cause to be the failure of the crew to recognize the activation of the stick-shaker as an imminent warning of entrance to aerodynamic stall and their failure to execute proper procedures for recovery from the loss of control. They also cited a cause as confusion by the flight crew due to the erroneous indication of increasing airspeed and associated overspeed warning.